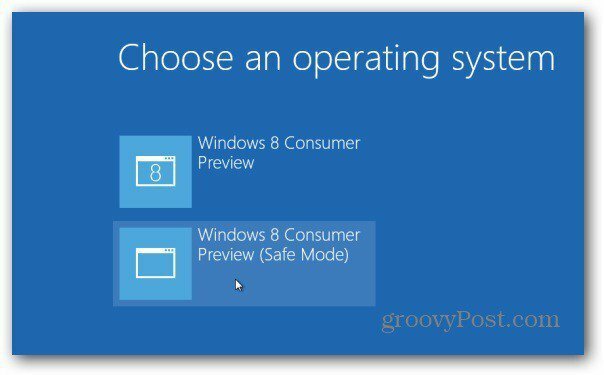 The days of booting Windows in Safe Mode by hitting F8 during boot are gone in Windows 8. You must first enable Safe Mode before you get advanced boot options. Here’s how to set it up. Gone are the days in earlier version of Windows where you repeatedly mash the F8 key to get into Safe Mode. 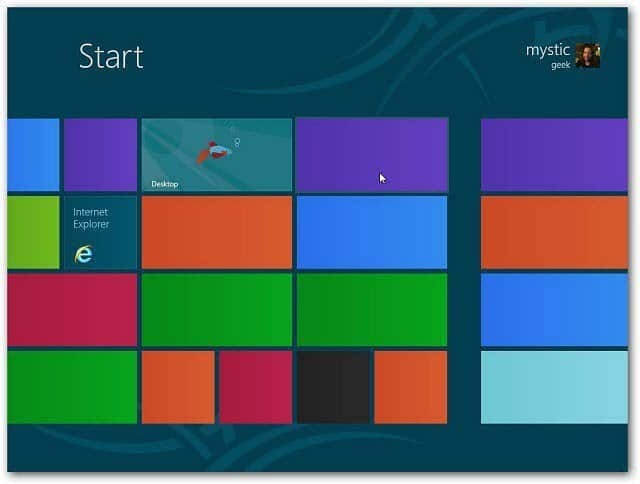 In Windows 8 Consumer Preview, you’ll need to manually enable it first. It’s not a user friendly method either. You’ll need to run some Command line magic using BCDEdit tool. 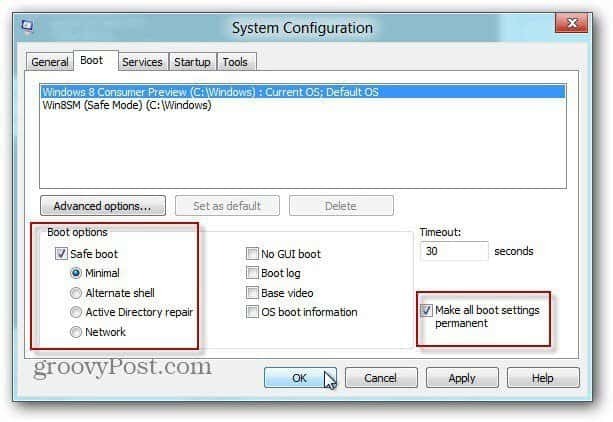 It’s a tool included in Windows to store and define boot applications and settings. 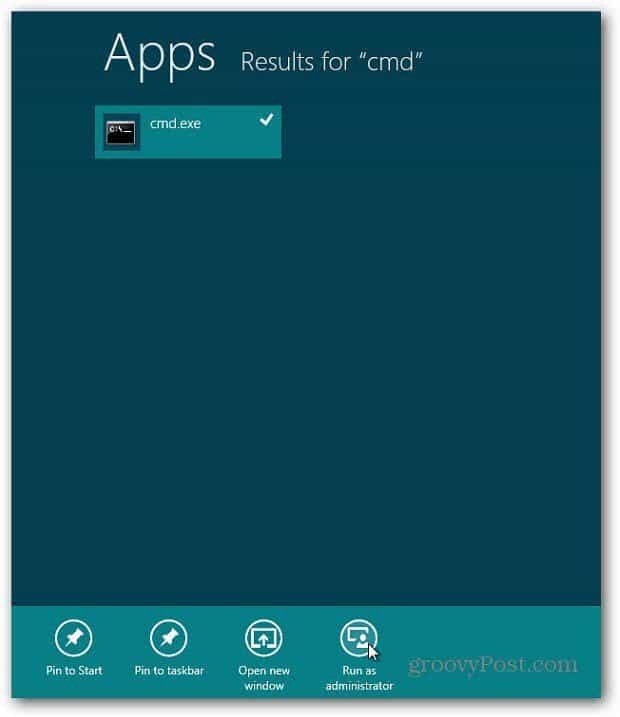 First, from the Metro Start screen type: cmd into the Search box. Right click cmd.exe and select Run As Administrator from the bottom bar. The Command Prompt comes up. Type: bcdedit/enum /v and hit Enter. 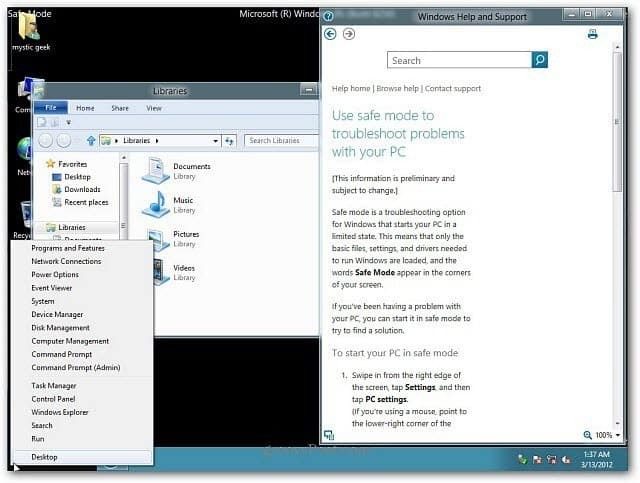 This give you info about the Windows Boot Manager and Windows Boot Loader. 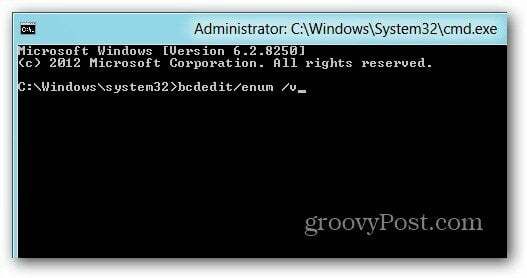 Right click an area in the Command prompt and click Mark. Now highlight the Identifier under Windows Boot Loader. Next, you should copy it into Notepad so you have it saved. This way when you run the next command, you’ll have easier access to it if you type something in wrong. 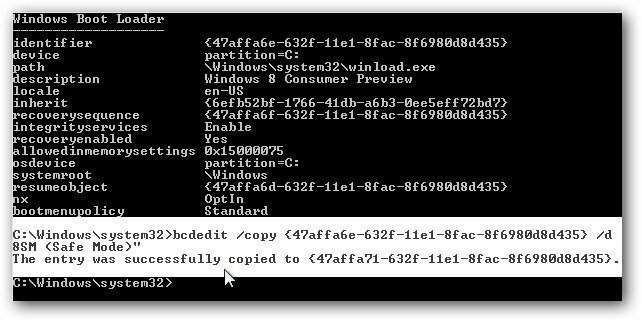 In the Identifier brackets you put in the Identifier you copied under Windows Boot Loader. And for Description you can type in anything you want to call it. Here’s my example. You can see the entry was successfully copied. Still some more steps…I know it’s tedious. 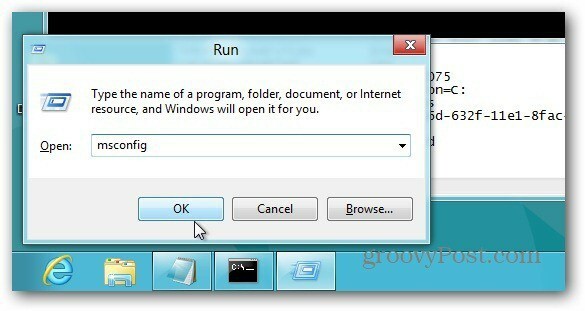 Now while still on the Desktop, use Windows Key + R to launch the Run dialog. Type: msconfig and hit Enter. The System Configuration screen comes up. Select the Boot tab and under Boot Options check Safe Boot. Under Timeout check Make All Boot Settings Permanent. Click OK.
You’ll get a message asking if you’re sure you want to change the settings, click Yes. Now reboot your machine. Press the F8 key before Windows starts. You’ll get Advanced Boot Options. Click Safe Mode. That’s it. You’re now in Safe Mode and can start troubleshooting your system. If you hit the Windows key to get the Metro Start screen, you’ll see most app tiles are blank because you’re in Safe Mode. If you click one of the blank tiles, you’ll get the following message the app isn’t available. 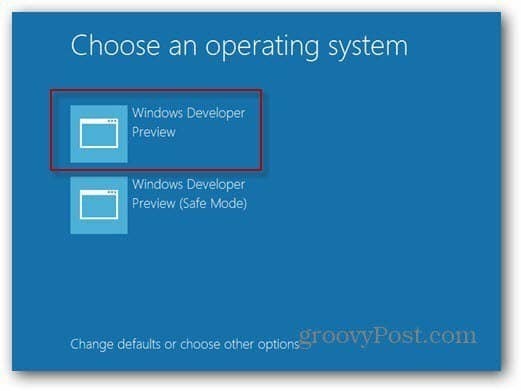 If you want to get out of Safe Mode, restart your system and select Windows Developer Preview. Ok, I see. 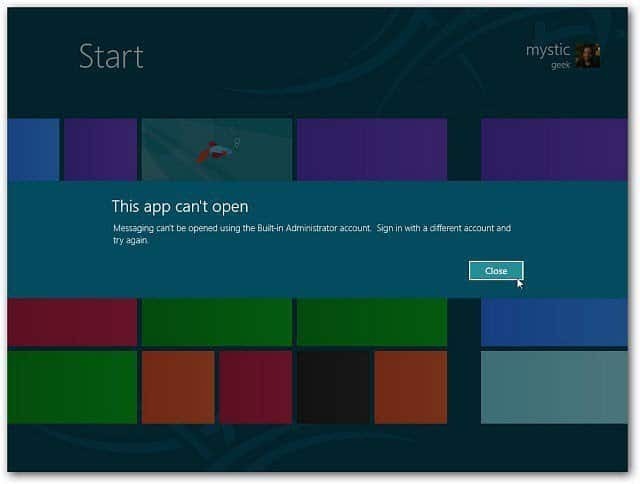 Bud the most important, if you do not knew this and now you have a start problem, how can you get access to safe mode? Would be funny but is tragic, you need set up your machine to get access to safe mode. How Microsoft could be do that? There are hope to me?